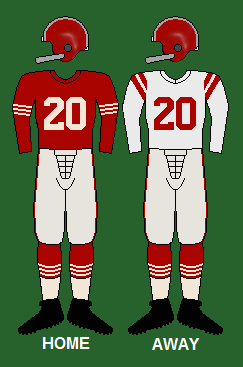 The 1953 San Francisco 49ers season was the team's fourth season in the NFL, and were coming off a 7–5–0 record in 1952. The 49ers would play consistent football all season long, never losing consecutive games throughout the season en route to a franchise best 9–3–0 record. However, the 49ers would lose both games against the Detroit Lions, who finished the season 10–2–0 to win the Western Conference and earn a spot in the NFL Championship game. Offensively, San Francisco was led by quarterback Y.A. Tittle, who threw for 2121 yards and 20 TD's while completing 57.5% of his passes. Running back Joe Perry had another great season, rushing for 1018 yards along with 10 TD's, while Hugh McElhenny rushed for 503 yards and 3 TD's, and caught 30 passes for 474 yards and 6 TD's. Wide receiver Billy Wilson would catch a team high 51 passes for 840 yards and 10 TD's.